Review: The Victorians were nothing if not really, really dramatic. Anna Katharine Green was no exception and her mystery novel, The Leavenworth Case, proves it. There is Fainting. There is Swearing Before God. There are Secret Marriages. Wild Accusations. Love at First Sight. And, of course, 11th Hour Revelations. A Full Confession. All those things and many more, and all deserving of mid-sentence capitalization. And all shared with much more wordiness than necessary. I must admit that the more I read Victorian literature that was popular with the Victorians, the more I judge them (Yes. All of them). They seem, on the whole, a very bizarre bunch prone to monologues and lectures and excessive use of italics and exclamation points. I find it hard to believe there were many sensible people around in the time period, especially as they all seem to conveniently put their every dastardly thought into writing to be found by someone later on at a key moment. The Leavenworth Case was not my cup of tea. It centers around a locked-room murder of a very wealthy man whose name, unsurprisingly, was Leavenworth. Mr. Leavenworth had two nieces, one of whom would inherit all his money and the other of whom wasn't going to get anything. There was no real reason for this at all- both nieces were very pretty and seemed very attached to their uncle, but he bizarrely only wanted to give his money to one of them. What follows is a very complicated (might I say convoluted?) mystery involving many people and a whole lot of partially-burnt pieces of paper (really, you'd think one would be more careful) of trying to determine who killed him. There were multiple narrative voices in this story: we have the actual narrator who tells the story, but we also have other characters take on the role of narrator to relate their stories and involvement with the crime. The thing is, I couldn't tell the difference between any of these narrative voices. They all sounded the same to me, from dialect to sentence construction to anything else that lends distinction, even though people came from different walks of life and even different countries. So with that caveat, I was even more lost with the other characters. It took me a very long time to differentiate between Mr. Leavenworth's nieces, for example. I also thought the story could do with some editing, but then I often feel that most Victorian novels could do with some editing. I really dislike the last-minute confession from the villain who then proceeds to tell us his version of the story, explaining every single puzzling detail of the story- it is just sloppily done, in my view, and also seems a bit lazy. There must be a less bludgeoning way to share the information than that, to integrate it more into the story. There was also a longer-than-necessary explanation of Mr. Leavenworth's very random hatred of Englishmen. I don't think this odd characteristic added much at all to the story, and could easily have been tweaked to be taken out without any harm done and at least a few pages removed. The multiple conversations about and mullings over the exact same clues could have been reduced, too. I am saying all the bad things, but I do see how this book was engaging to its readers. The mystery is very complicated and seems to go in many different directions. Just when you think you've gotten to the end, some other twist comes up. The detective in the story, Mr. Ebenezer Gryce (was Ebenezer just a really popular name in the Victorian era?! I don't get it), was also a funny and endearing guy- the only character, really, who stood out to me as an individual. 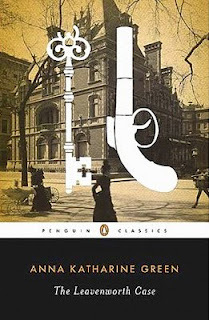 While I don't think I'll be reading any more of Green's novels, this one was a lesson in patience, and if you are one of those who truly does enjoy Victorian sensibilities and dramatics, then maybe you should give one a go.